The internet rarely lets truth get in the way of a good story, which can spread worldwide before anyone checks the facts. A now infamous Tourist Guy pic arrived in the wake of the 9/11 attacks, purportedly from a camera found in the debris. It seemed to show an unsuspecting punter posing on the observation deck of the World Trade Center, while in the background a plane was seconds away from crashing into the tower. It soon emerged that he was a Hungarian man named Péter Guzli who had digitally altered a snap taken four years previously as a joke for friends. Behind you! An action-packed pic of a film crew fleeing from a bear went viral last year as an example of wildlife photography gone wrong. It turns out it was the work of a bored film crew while location scouting in Colorado in 2011. They posed for a photograph running in fear, then added a stock photo of a bear, just to amuse their families back home. It got lifted off Facebook and spread like wildfire. Was it fake? Do bears take comfort breaks in the woods? 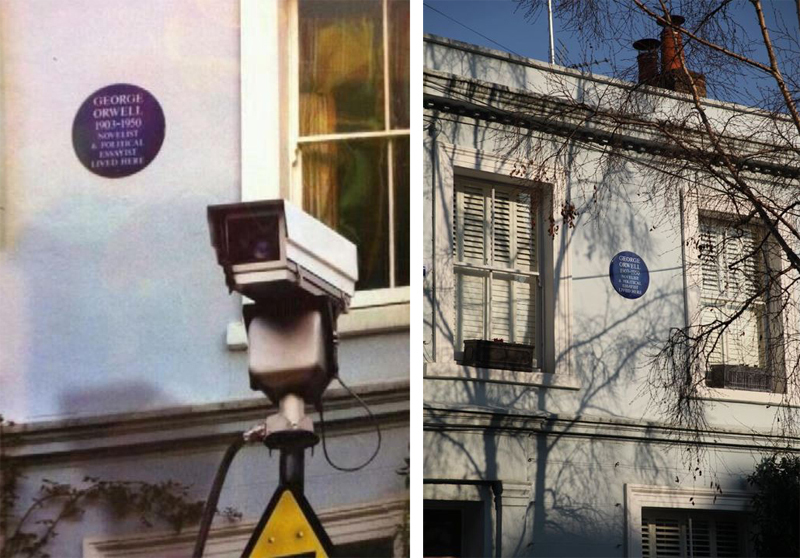 A CCTV camera positioned on George Orwell’s old house. Ministry of Irony or what? Except this image, which first went viral in 2012 and has been doing the rounds since, isn’t real. It’s retouched by snapper Steve Ullathorne, who had digitally added modern details to a series of historically significant buildings. There is no surveillance camera on the 1984 author’s Portobello Road residence. Or is there? No, there isn’t. Jaws-dropping. 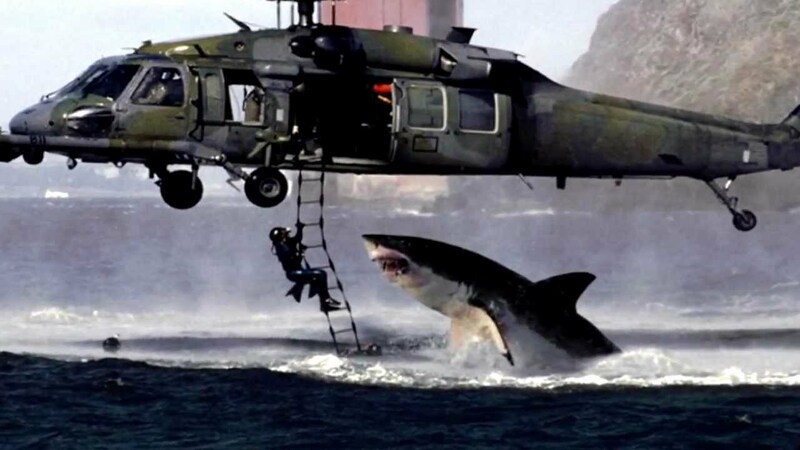 Circulated via email claiming it had been crowned National Geographic Photograph of the Year, 2001’s classic Helicopter Shark pic showed a great white attacking soldiers climbing a ladder dangling from a Black Hawk chopper – usually with a subject line like: “And you think your [sic] having a bad day at work!! !” Of course, it was a mashup of two shots: one of a shark in South Africa, the other of a military manoeuvre near the Golden Gate bridge. 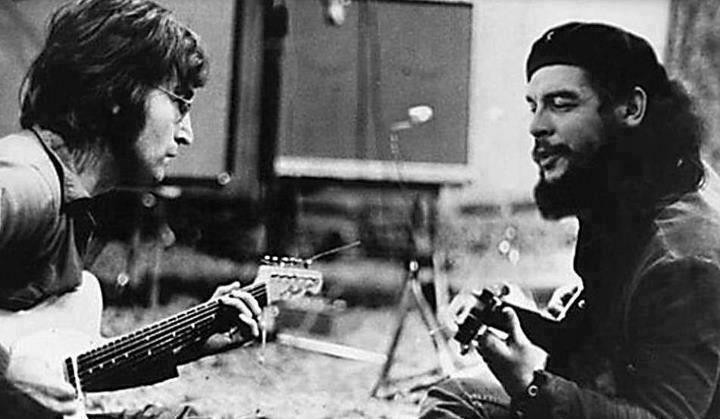 Whoaa, who knew that John Lennon had a jamming session with the Cuban revolution leader and popular T-shirt logo Che Guevara? Sadly, this student-friendly supergroup never happened. Some wag swapped Che’s face on to the body of the vaguely Guevara-looking guitarist Wayne “Tex” Gabriel from Plastic Ono Band cohorts Elephant’s Memory. Straw-beret fields for ever.